The Huskie had an unusual intermeshing contra-rotating twin-rotor arrangement with control effected by servo-flaps. The first prototype flew in 1947 and was adopted by the U.S. Navy with a piston engine. In 1954, in an experiment by Kaman and the U.S. Navy, one HTK-1 was modified and flew with its piston engine replaced by two turbine engines, becoming the world's first twin-turbine helicopter. The Air Force later adopted a version with one turboshaft engine: HH-43B and F versions. This aircraft saw use in the Vietnam War with several detachments of the Pacific Air Rescue Center, the 33d, 36th, 37th, and 38th Air Rescue Squadrons, and the 40th Aerospace Rescue and Recovery Squadron, where the aircraft was known by its call sign moniker "Pedro". 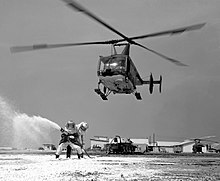 During the war, the two-pilot HH-43 Huskie flew more rescue missions than all other aircraft combined, because of its unique hovering capability. The HH-43 was eventually replaced by newer aircraft in the early 1970s. In addition to those on static display and the airworthy example at the Olympic Flight Museum, many H-43s are still in use with private owners. UB6166 – HH-43B is on display at the Defence Services Museum in Naypyidaw, Mandalay. 62-4547 – HH-43F on static display at the Hubschraubermuseum Bückeburg in Bückeburg, Lower Saxony. 62-4556 – HH-43P on static display at the Pakistan Air Force Museum in Karachi, Sindh. H5-2/05 – Type 5 on static display at the Royal Thai Air Force Museum in Bangkok, Bangkok. 62-4535 – HH-43B under restoration at the Midland Air Museum in Baginton, Warwickshire. This airframe is one of only two examples on display in the United Kingdom. Composite – HH-43F on static display at the New England Air Museum in Windsor Locks, Connecticut. This airframe is painted as 60-0289, but was built up from parts of various HH-43s. 129313 – HTK-1/TH-43E on static display at the Tillamook Air Museum in Tillamook, Oregon. This airframe is painted in Navy markings. 129801 – HOK-1/OH-43S in storage at the New England Air Museum in Windsor Locks, Connecticut. 138101 – HOK-1/OH-43D in storage at the United States Army Aviation Museum at Fort Rucker near Daleville, Alabama. BuNo 138101 was formerly displayed indoors at the National Naval Aviation Museum at NAS Pensacola, Florida (circa 1986-2001) in a dark blue finish with USMC markings. 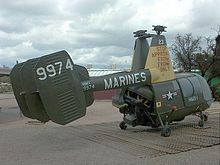 It was repainted from its original USMC markings to pre-Vietnam U.S. Army colors when it was loaned to the Army by the National Naval Aviation Museum. 139974 – OH-43D on static display at the Pima Air & Space Museum, adjacent to Davis-Monthan AFB in Tucson, Arizona. This airframe is painted in USMC markings. 139982 – HOK-1/OH-43D in storage at the Carolinas Aviation Museum in Charlotte, North Carolina. This airframe is painted in Marine Corps markings. 139990 – HOK-1/OH-43D in storage at the Flying Leatherneck Aviation Museum at MCAS Miramar in San Diego, California. This airframe is painted in USMC markings. It was previously on display at MCAS Tustin in Tustin, California; but was moved to MCAS Miramar after MCAS Tustin was closed and NAS Miramar was transferred from control of the Navy to the Marine Corps. 58-1837 – HH-43A in storage at the New England Air Museum in Windsor Locks, Connecticut. 58-1841 – HH-43F on static display at the Military Firefighter Heritage Display at Goodfellow Air Force Base in San Angelo, Texas. It is incorrectly painted with Air Force Serial Number 58-1481. 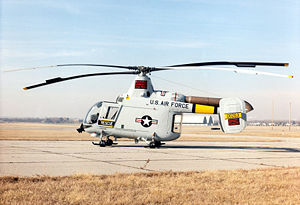 This Huskie was a ground trainer (circa 1962–1976) at Sheppard Air Force Base, so it retained the square-tail empennage that was removed from almost all other Huskies after repeated rotor strikes in heavy winds. After being sold by the military, but before arriving at its current location, it was on display at the Pate Museum of Transportation in Cresson, Texas. 58-1853 – HH-43F on static display at the Museum of Aviation at Robins Air Force Base in Warner Robins, Georgia. 59-1578 – HH-43F on static display at Kirtland Air Force Base in Albuquerque, New Mexico. This may be the same airframe listed on other sites[who?] as being located at the National Museum of Nuclear Science & History, which has since moved off-base, but adjacent to, Kirtland Air Force Base. 60-0263 – HH-43B on static display at the National Museum of the United States Air Force at Wright-Patterson AFB in Dayton, Ohio. 62-4513 – HH-43F on static display at the Castle Air Museum at the former Castle AFB in Atwater, California. 62-4531 – HH-43F on static display at the Pima Air & Space Museum adjacent to Davis-Monthan AFB in Tucson, Arizona. 62-4532 – HH-43B on static display at the Air Mobility Command Museum at Dover AFB in Dover, Delaware. 62-4561 – HH-43B on static display at the Hill Aerospace Museum at Hill AFB in Roy, Utah. 64-17558 – HH-43F airworthy at the Olympic Flight Museum in Olympia, Washington. This airframe is painted in USAF markings. ^ "FlightGlobal World Helicopter Market - Page 49". flightglobal.com. July 1968. Retrieved 2013-02-05. ^ "FlightGlobal World Helicopter Market - Page 50". flightglobal.com. July 1968. Retrieved 2013-02-05. ^ "IIAF HISTORY". Copyright © 1999-2012 IIAF.net. Retrieved 26 January 2013. ^ "Iran Air Force HH-43F Huskie". Demand media. Retrieved 26 January 2013. ^ "Military Helicopter Market 1971 pg. 579". flightglobal.com. Retrieved 21 March 2015. ^ "Decommissioned Aircraft PAKISTAN AIR FORCE". Retrieved 26 January 2013. ^ "ROYAL (Archives) THAI AIR FORCE" (PDF). RTAF.af. Retrieved 26 January 2013. ^ "Kaman HH-43B Huskie (K-600)". Demand media. Retrieved 26 January 2013. ^ a b "Kaman HH-43 Huskie." National Museum of the United States Air Force. Retrieved: 5 September 2015. ^ "Kaman HOK-1 (OH-43D) Huskie US MARINES". H43-huskie.com. Archived from the original on 11 January 2012. Retrieved 26 January 2013. ^ "Kaman HUK-1 (UH-43C) Huskie US NAVY". H43-huskie.com. Archived from the original on 2 June 2015. Retrieved 26 January 2013. ^ "Preservation Notes - Myanmar". Air-Britain News. Air-Britain: 380. March 2014. ^ "Kaman HH-43F HUSKIE". Das Hubschraubermuseum Buckeburg. Retrieved 31 October 2016. ^ a b c d e f g h Ragay, Johan (25 August 2016). "PRESERVED Kaman H-43 Huskie". Ragay.nl. Retrieved 31 October 2016. ^ "Aerial Viuals - Airframe Dossier - Kaman H-43, s/n 62-4556 PakAF, c/n 182". Aerial Visuals. AerialVisuals.ca. Retrieved 31 October 2016. ^ "Airframe Dossier - Kaman HH-43B Huskie, s/n H5-2/05 RTAF, c/n 115". Aerial Visuals. AerialVisuals.ca. Retrieved 31 October 2016. ^ "Aircraft Listing". Midland Air Museum. Midland Air Museum. Retrieved 31 October 2016. ^ "Kaman HH-43F 'Huskie'". New England Air Museum. New England Air Museum. Retrieved 31 October 2016. ^ "Aircraft". Tillamook Air Museum. Retrieved 31 October 2016. ^ "Airframe Dossier - KamanH-43, s/n 129313 USN". Aerial Visuals. AerialVisuals.ca. Retrieved 31 October 2016. ^ "HUSKIE ". Pima Air & Space Museum. Pimaair.org. Retrieved 31 October 2016. ^ "139982". Flickr. Retrieved 31 October 2016. ^ "Aircraft Listing" (PDF). Flying Leathernecks. Flying Leatherneck Historical Foundation. Retrieved 30 October 2016. ^ "Airframe Dossier - Kaman OH-43D Huskie, s/n 139990 USN, c/r N5190Q". Aerial Visuals. AerialVisuals.ca. Retrieved 31 October 2016. ^ Mock, Stephen P. (July 2005). "Pedro's Big Move". Pedro News. Retrieved 31 October 2016. ^ "HH-43F "HUSKIE"". Museum of Aviation. Retrieved 31 October 2016. ^ "Airframe Dossier - Kaman HH-43F Huskie, s/n 59-1578 USAF". Aerial Visuals. AerialVisuals.ca. Retrieved 31 October 2016. ^ "Kaman HH-43B Huskie". National Museum of the US Air Force. 18 May 2015. Retrieved 31 October 2016. ^ "OUR COLLECTION". Castle Air Museum. Archived from the original on 14 November 2016. Retrieved 31 October 2016. ^ "Airframe Dossier - Kaman HH-43F Huskie, s/n 62-4513 USAF, c/n 139". Aerial Visuals. AerialVisuals.ca. Retrieved 31 October 2016. ^ "HUSKIE [62-4531]". Pima Air & Space Museum. Pimaair.org. Retrieved 31 October 2016. ^ "HH-43B Huskie". Air Mobility Command Museum. AMC Museum Foundation, Inc. Retrieved 31 October 2016. ^ "HH-43B "Huskie"". Hill Air Force Base. 19 October 2010. Retrieved 31 October 2016. ^ "HH-43 Huskie". Olympic Flight Museum. Olympic Flight Museum. Retrieved 31 October 2016. ^ "Airframe Dossier - KamanH-43, s/n 64-17558 USAF, c/r N4069R". Aerial Visuals. AerialVisuals.ca. Retrieved 31 October 2016. ^ "FAA REGISTRY [N4069R]". Federal Aviation Administration. U.S. Department of Transportation. Retrieved 31 October 2016. Wikimedia Commons has media related to Kaman HH-43 Huskie. This page was last edited on 7 March 2019, at 01:02 (UTC).